This 1868 unsigned diary was recently discovered among the holdings of the Hamilton County Historical Society. After some research, it was determined to have been written by none other than Dr. John Washburn, founder and first President of Ewing Baptist College, Ewing, Illinois. The ledger-sized journal was easy to read, although some of the pages in the back had been torn in two and parts were missing. Enough was left to show a window into his life in 1868. Dr. Washburn came to Illinois from Tennessee in 1862. He taught school in the Benton area and became well-known as an educator. In the Fall of 1867, he started a subscription high school at Frizzle's Prairie Baptist Church near Ewing. He also became pastor of the Ewing Baptist Church. The high school was moved to Wakeman Hall in Ewing in 1871 and in 1874, it became a college. The diary shows his day-by-day activities, trials, musings and meticulously kept finances, showing his income and expenses. At one time, he had only .30 to his name. He served as pastor of McLeansboro First Baptist Church from 1894 to 1898. Following his passing in 1905, he was buried in the McLeansboro IOOF Cemetery. In his diary, many Franklin County and Hamilton County names are mentioned. You will enjoy reading his perspective of happenings in his day. 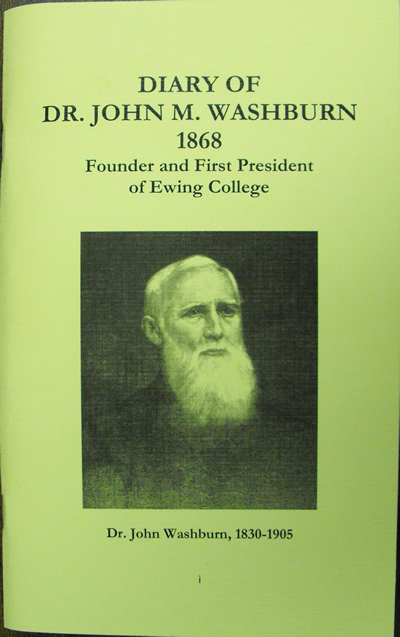 This 5½"x 8½" 50 page, softback book is fully indexed, with an introduction added to give background information about the author and the college. Also, several pictures have been included to add visual interest to the people and places he mentions. 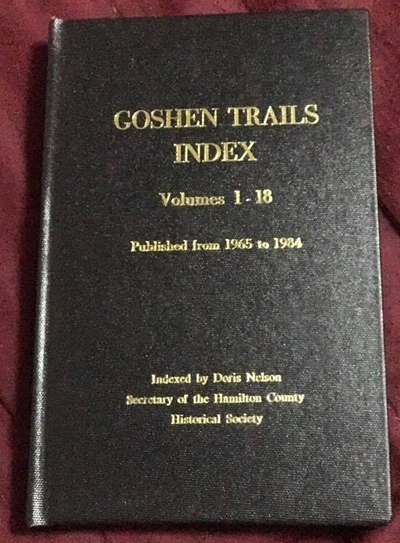 This book was transcribed by Doris Nelson, Secretary of the Hamilton County Historical Society, and is being published by the Society. It sells for $8.00, plus $3.00 postage and handling. There is a limited printing, so order your copy today, while they last! 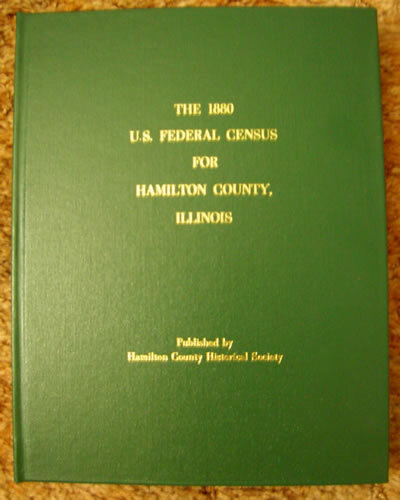 The Hamilton County Historical Society is proud to announce that the 1880 Census has been published. It was extracted by Micki Faruzzi from the National Archives of the United States 1934 microfilm, Call #929-773, Micro Copy #T9, Roll #210 and typed by Linda K. Arview.This census will be a valuable tool for the genealogist or anyone looking for information about their family. Each entry contains relationship to the head of the family, race, gender, age at last birthday, occupation (if applicable), number of months person has been unemployed during the census year (if applicable), reason unable to attend ordinary business (if applicable), place of birth, place of birth of person's father, and place of birth of person's mother. The 1925 Tri-State Tornado stayed on the ground through three states, from Missouri to Indiana, and was the longest tornado ever recorded. A lot has been written about the destruction left by the tornado in other counties, but not much has been recorded about what happened in Hamilton County. 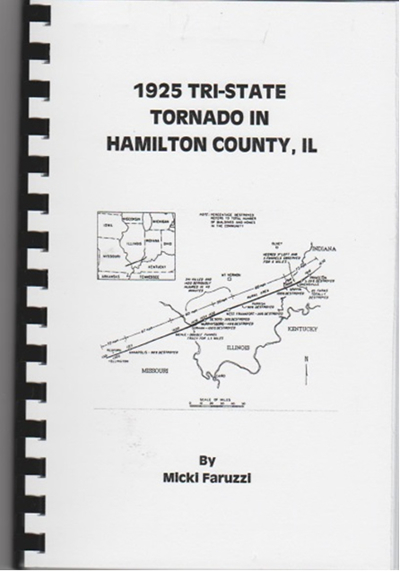 In this book, Micki Faruzzi follows the tornado across the county and tells of its destruction as it traveled, recording each home and family that was destroyed or affected by the storm. She also includes a day-by-day time-line of what happened after the storm, when the Red Cross came in and turned McCoy Library into a hospital for a time. There is a section of personal stories told by people who experienced it, and a lot of pictures of persons who were involved, and much more. The book is 8½ x 5½, soft back, around 150 pages, sells for $20.00, plus $3.00 postage and handling if mailed. 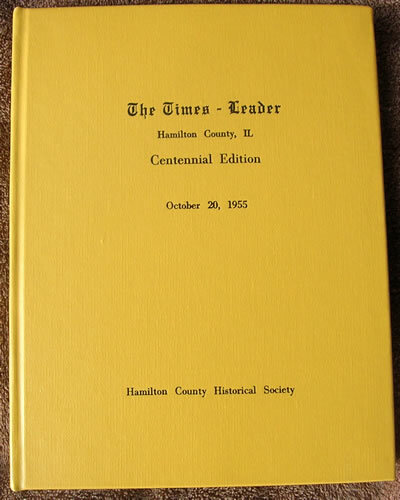 The McLeansboro Times-Leader celebrated its 100th anniversary by outdoing itself with this nine section edition of the newspaper, published in 1955. It took many months and many writers to put this edition together, and resulted in an outstanding collection of articles and hundreds of pictures depicting the history of our county and businesses of the day. "John Stelle, Hamilton Native, Ex-Governor" (several articles about our famous home-town Governor); and many other articles. What makes this book unique is the excerpts from 100 years of newspapers included in the different sections. Every ad has been recreated as close to the original as possible. This is one book you don't want to miss! 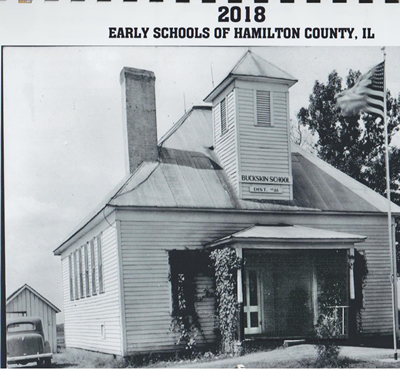 The Hamilton County Historical Society's new calendar for 2018 features 13 early schools of Hamilton County. There were around 100 schools in this county at one time, but we had room for only 13 in this calendar. They are black and white full-page glossy pictures. A brief history of each school is included below the picture. Schools in this calendar are: Buckskin, Aden, Anderson, Dale, Delafield, East Side, Harrawood, Hoodville, Mary's Chapel, Shady Grove, Thackeray, Walpole High School, and West Side. Each calendar sells for $15.00 each. Orders of 10 or more receive a 10% discount. By John B. Kinnear. 25 pages, 5 ½" X 8 ½". This book was originally written in 1883-1884. In this history, the former school superintendent details the town's formation, schools, churches, societies and more. The volume includes hundreds of family names and has been newly indexed. 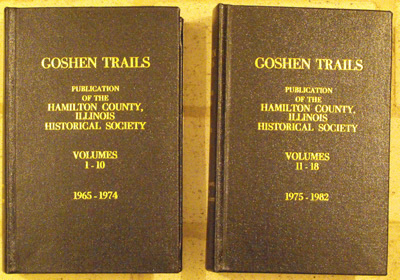 This two-volume set contains every issue of Goshen Trails, the society's historical journal published from 1965 to 1982, and is a must for libraries, historians, genealogists, or anyone interested in learning more about the history of Hamilton County, IL. These books are hardbound, 5½" x 8½" and are indexed. There are over 1200 pages in the set. Book 1 contains the first 10 volumes and covers the yearspan of 1965 to 1974. Book 2 contains volumes 11 to 18 and covers the years 1975 to 1982. These books can only be ordered as a set. It is 200 pages, 8 1/2 x 5 1/2, hardback and is an index to both of the volumes above. There is a price break (see order forms) if all 3 are ordered at the same time. 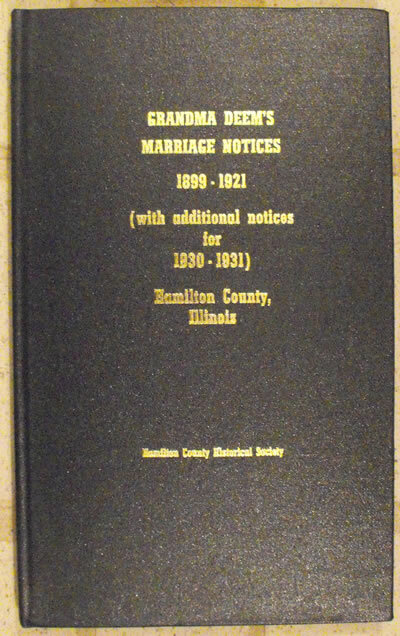 This newest book is the last of Grandma Deem's scrapbooks, containing marriage notices from Hamilton County and Southern Illinois newspapers. This is an 8½" x 14" hardbound book that contains 287 pages. It is indexed. 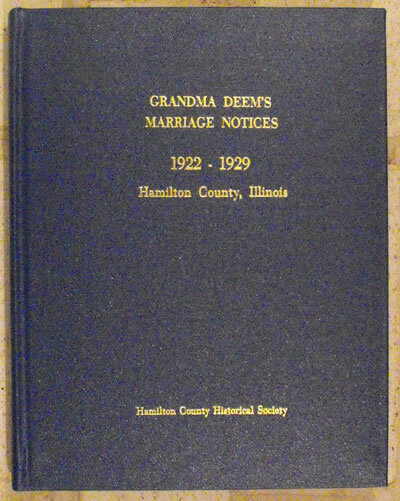 This book contains marriage notices covering the time period from 1899 to 1921 and 1930 & 1931. This book is a collection of hundreds of clipped marriage notices from Hamilton County and Southern Illinois newspapers. This is an 8½" x 11" hardbound book that contains 287 pages. It is indexed. This book contains marriage notices covering the time period from 1922 to 1929. 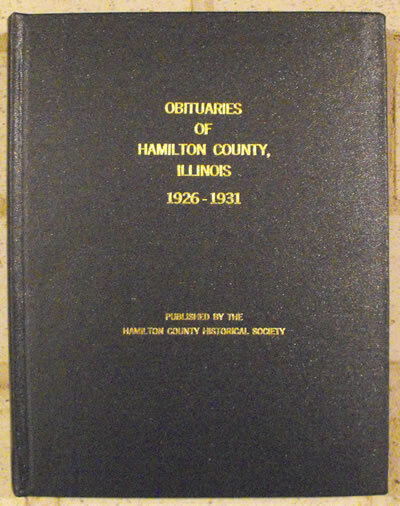 First published in 1989, this scrapbook of Hamilton County and Southern Illinois obituaries dating from 1917 to 1925 proved to be a popular source of information for genealogists and family historians. This is an 8½" x 14" hardbound book that contains 334 pages. It is indexed. This book contains obituaries covering the time period from 1917 to 1925. 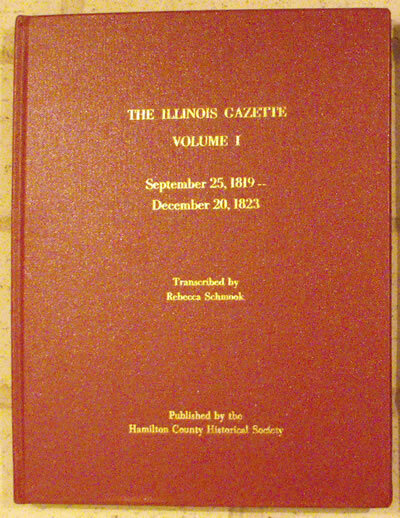 This two-volume set contains gleanings from the rare Illinois Gazette newspaper published from 1819-1830 in Shawneetown, Illinois. There were very few newspapers at the time our state was in its infancy, so this is a valuable resource for people searching for their relatives or just reading about the happenings of the day. The newspaper was published for many years by James Hall, who was a well-known lawyer and author of his day. It contains articles about marriages and deaths, commissioners reports, ads for runaway slaves, and much more. These excerpts were transcribed by Becky Schmook of Harrisburg, IL, from microfilm, and is now offered to you by the Hamilton County Historical Society. These are hardbound 8½" x 11" books with over 200 pages in each book. Volume I covers the timespan from 25 September 1819 to 20 December 1823. Volume II covers 24 January 1824 to 18 December 1830. These books may be ordered separately. 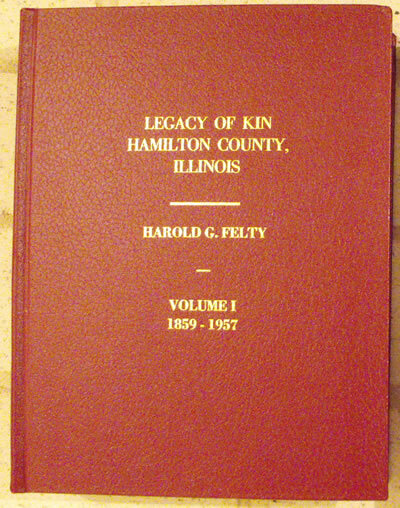 This set of books are some of the most authoritative and comprehensive genealogy reference books for Hamilton County, IL and southern Illinois ever published. They contain many obituaries and related notes abstracted from Hamilton County newspapers by Harold and Christine Felty over 14 years. These are hardbound 8½" x 11" books with over 1000 pages in each book. They are fully indexed to include those who died and anyone else mentioned in the document being extracted. Volume I covers the yearspan of 1859 - 1957. This is only in reference to the death information that was extracted from newspapers. 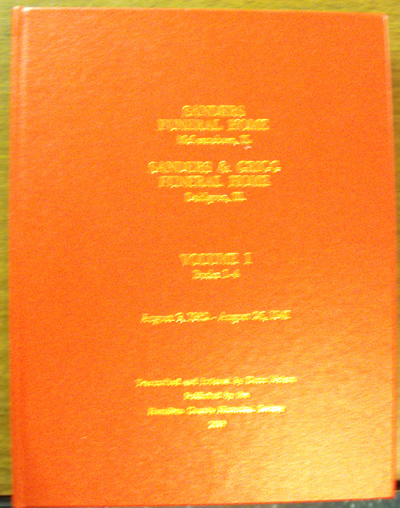 It also contains extracts from the first Hamilton Co., IL probate book which lists probates from 1823 to 1838. Each entry includes all names mentioned in the settlement of the estate. Starting in 1859, any mention of deaths is extracted including publication notices and administrators. Volume II covers 1958 - 1992. 100 years ago, then McLeansboro Times editor M.E. Daniel assembled these special supplements to promote the community and attract businesses. 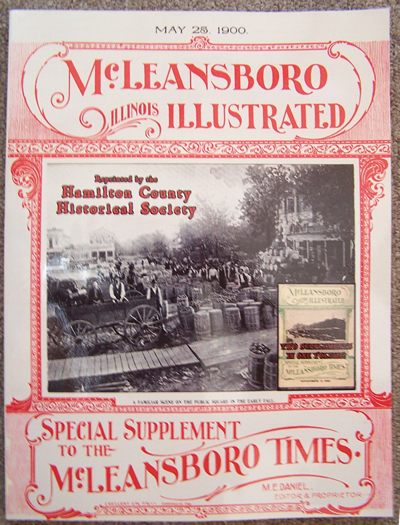 McLeansboro Illustrated contains information about prominent individuals, businesses, organizations, local government, churches, and schools and has more than 175 pictures and more than 500 names of individuals. This is an 8½" x 11" softcover book that contains 70 pages. It is indexed. Now in hard back for the first time, this valuable research tool is back. Taken from four scrapbooks, this collection of complete obituaries from area newspapers provides a wealth of genealogy information at your fingertips. This is an 8½" x 11" hardbound book that contains 473 pages. It is indexed. 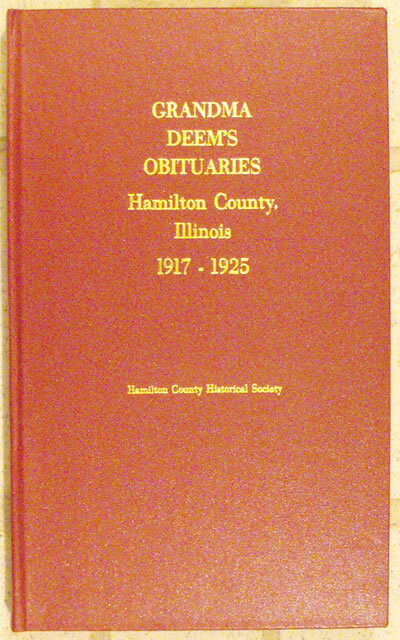 This book contains obituaries covering the time period from 1926 to 1931. 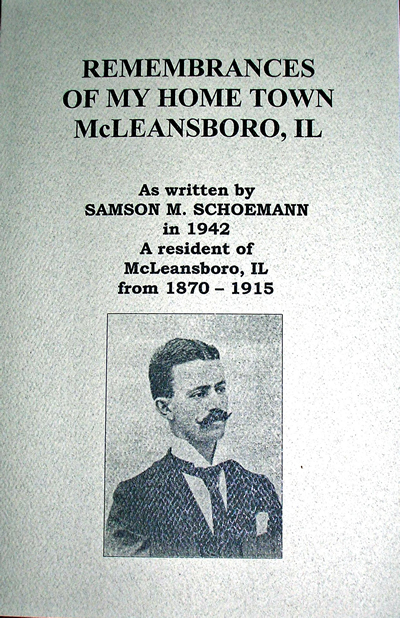 Mr. Schoemann was a resident of McLeansboro, IL from 1870-1915 and ran a clothing store on the square with his brother Gustav. In 1942, he sat down and wrote down his remembrances of his time in McLeansboro, for his children. He talks about his neighbors and acquaintances, of which there were many, along with the businesses, churches, and events as he remembered them. 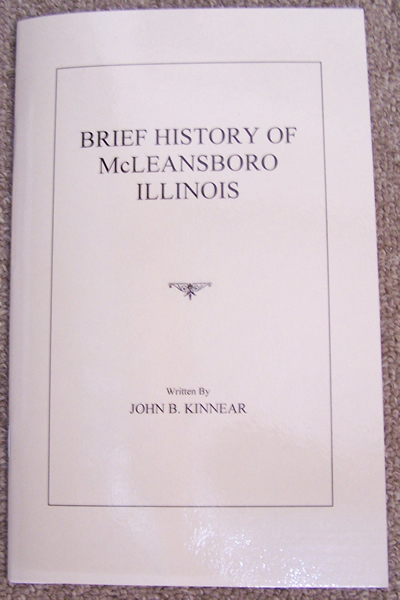 This book contains insights about life in McLeansboro that won't be found anywhere else. This is an 5 ½" x 8 ½" softback book that contains 133 pages. It is indexed. This volume contains the first four books of the seven books kept by Walter "Pa" Sanders for Sanders Funeral Home from 1934 to 1947. Volume 2 (the last three books) will be published at a later date. There are names in this book that have not been found in previous publications. Additional information (where available) from Legacy of Kin and Find-a-Grave web site has been added in italics. Most entries contain date of death, date of birth, age, place of death, place of residence, date of funeral, cause of death, minister, doctor, occupation of deceased, parents of deceased, cemetery where buried, and to whom the funeral is charged. It is a very valuable research tool for genealogists and historians. The book is 8½ x 11, hard back, around 170 pages, sells for $35.00, plus $3.00 postage and handling if mailed.